Thousands of people braved sub-zero temperatures overnight at an event to raise awareness of homeless. 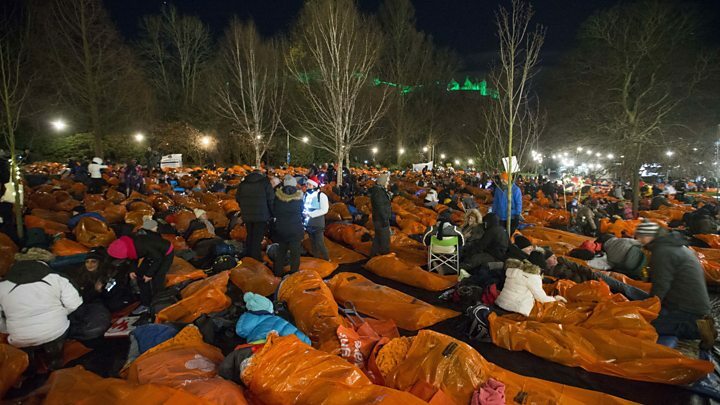 More than 8,000 spent the night in Princes Street Gardens in Edinburgh as part of Sleep in the Park, according to organisers Social Bite. Participants had to raise at least £100 to take part and donations topped £3.6m at the beginning of the evening. Liam Gallagher, Deacon Blue, Amy Macdonald and Frightened Rabbit also performed stripped-back sets. John Cleese told a bedtime story and Rob Brydon, Sir Chris Hoy and Sir Bob Geldolf spoke to the crowd. In a tweet on Sunday morning, Sir Chris Hoy said temperatures dropped to -5C and he woke up "covered in a layer of frost". Deputy First Minister John Swinney also took part in the event alongside fellow MSPs Kevin Stewart, Angela Constance and Ben Macpherson. Paddy Baxter was one of those who took part in the event. He told BBC Radio Scotland: "I think I wore everything I owned... I had a pair of sports socks, hiking socks, hiking boots, then I had running tights, long-johns, trousers. "I've got an Under Armour top, a T-shirt, a jumper, a thermal jumper, a woolly jumper that my mum knitted for me, and a jacket - a ski jacket - so even with all that, I was still cold." Journalist Paul English, who also spent the night in Princes Street Gardens, said it gave him an insight into homelessness. "I'm not saying for a second that one night sleeping in a park in Edinburgh makes you an expert on what people who are unfortunate enough to live in these conditions are going through," he said. "But there is a certain amount of understanding and empathy that does come from having had that experience last night that even I didn't - and many others like me - appreciate. "People that I've spoken to on waking up this morning, they had an insight into something that last night when they bedded down, they didn't actually have." Josh Littlejohn, the co-founder of Social Bite, said there were 11,000 homeless households in Scotland. "When I think about all of the amazing different people, sleeping in this garden tonight, the one thing that strikes me about these statistics of homelessness is that they are not insurmountable," he said. "Scotland is a small enough country, a compassionate enough country and a collaborative enough country, where nobody has to be homeless here. If we put our heads together, we can wipe out homelessness in five years. "It is not a question of resource; it is simply a question of focus. And what the participants have all done tonight, by giving up their beds, is put a razor-sharp focus on the issue."